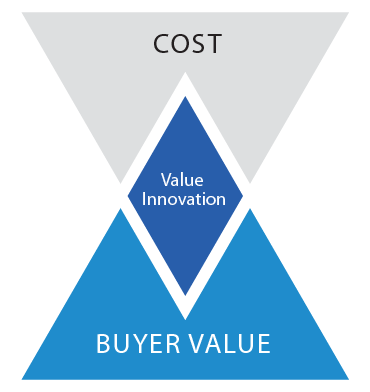 Value Innovation is the simultaneous pursuit of differentiation and low cost, creating a leap in value for both buyers and the company. The concept of Value Innovation is developed by W. Chan Kim and Renée Mauborgne and is the cornerstone of market-creating strategy. Because value to buyers comes from the offering’s utility minus its price, and because value to the company is generated from the offering’s price minus its cost, value innovation is achieved only when the whole system of utility, price, and cost is aligned. Cost savings are made by eliminating and reducing the factors an industry competes on. Buyer value is lifted by raising and creating elements the industry has never offered. What factors should be raised well above the industry’s standard? What factors should be created that the industry has never offered?